So, what IS that? It’s not a griddle, or is it? The one that I saw today was flat topped but had two round “lids” that had a hole to lift it open (like the old wood burning stoves). Under that was what appeared to be a place to INSERT a pot down on a gas burner below. 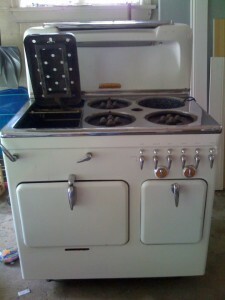 My grandmother has a 1950’s Frigidaire stove with a similar setup. The place to insert the pot onto a burner below is called a deep well. My grandmother used it to steam cook Cornish hens. She would partially fill the pot with water and place it in the well. Then she would place a hen with rice, onions, and cream of mushroom soup into a small metal dish with legs that fit down inside the pot and allowed the chicken to rest above the boiling water. She would place a lid over the pot and cook until the hen was tender and juicy. I’m getting hungry writing this! Hope that answers your question.